perhapablog... and other ramblings: rico, rico, rico--at the new york comicon! so last week i promised that, because of all the stress and strain we put him through, i would sing rico's praises here on the blog! 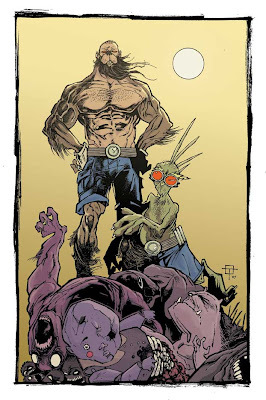 but, y'know--i really don't need a special REASON to be giving props to the man that makes the perhapanauts jump and sparkle each and every issue! the guy that makes their world come alive in such a magical way with his unique color choices and palette! he's the man! on the first series, if you look, we were keeping things low and told rico to keep everything flat, like a comic book from the 60's or 70's. and he did, in our opinion, an amazing job! on the second series, we had a better idea of what the book should feel like--we were gonna up the stakes and hopefully blow the doors open! we told rico to go crazy! and crazy he went! with every page that rico would send us, craig and i would just go "ahhhh!" it was beautiful! it was fourth of july! who did a fantastic job! ted finally commented--and we agreed--that the piece was just so much more powerful as a black and white. so sorry, rico. you are a saint. as for where you could actually go and MEET this coloring God--this master of the hue--look no further! rico renzi--along with blog regulars, brian mulcahy and scott weinstein will be manning the perhapanauts perhapa-table this weekend at the NEW YORK COMICON at the javitz center! that THIS WEEKEND--FEB 23-25~! come down and pick up all your favorite perhapanauts issues, trades, sketchbooks, choopie cards, and more! oh, and craig and i will be there too. Wish I could be there. Have a great time, fellas! Rico's got a great color sense and his work is amazing. It enhances Craig's line work, but never overwhems it and, as I've said elsewhere, his coloring of Molly is am essential part of her character. Really looking forward to hanging out with you guys at NYC. "Let there be wine, women and laughter, and save sermons and soda water for the day after."